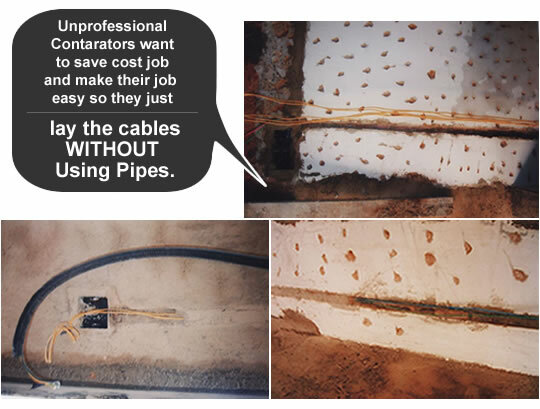 • Many contractors want to make their job easy and save the piping cost so they just lay the cables without using pipes, and leave the cables all over the place (illustrate picture). • Before we start the wiring work, we will do marking at the wiring point position. Then we will start to hack the wal for concealing the pipes (illustrate picture). After that we will insert all the cables in to the pipe. 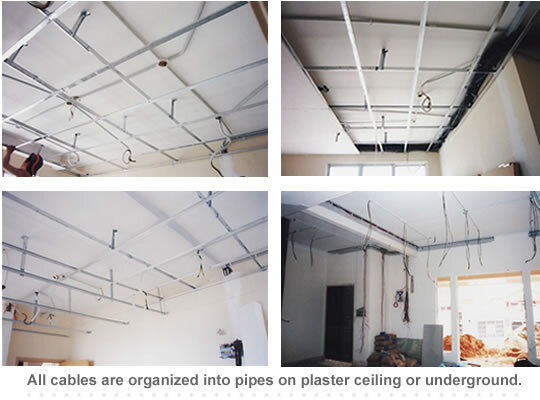 Even for lighting point (illustrate picture), we also ensure all cables are organized in to pipes between the roof and plaster ceiling to make sure all cables are well-protected from termites and rats. • The 2nd important point is every cable must be connected from the main power supply i.e. DB board. But many contractors connect one electrical point to another, which is called looping. This means the electrical points make use of one another’s electricity, but not using electricity from the main power supply. This way the contractors save their time. However, this is unsafe and can overload the cables, thus once again may cause the cables to overheat, and lead to fire or explosion. As for our company, our electricians only use the proper method to ensure the safety of our customers.